How and Where to Buy Propecia Online? You can buy Propecia online through CanadianPharmacyWorld.com at huge savings. We do require a valid prescription from your doctor. Our Canadian Pharmacy carries brand and generic medications from Canada as well as other international pharmacies. For more information and further details, please call Customer Service at 1866-485-7979 or email us. Are there Alternative Names for the Brand and Generic Propecia? The brand name Propecia comes from Canada, Turkey and New Zealand manufactured by Merck. The generic Finasteride comes from India (by Cipla called Finpecia) and Canada (by Auro Bingdo also called Auro-Finasteride or Sandoz). Canadian Pharmacy World also carries other medications for Hair Loss Treatment. What Dosages and Forms is Propecia available in? The brand and generic Propecia is available in the strength of 1 mg tablets only. The brand name Propecia tablets 1mg by Merck are orange eight sided tablets with the pill imprint “Propecia on one side and “P” on the other side. 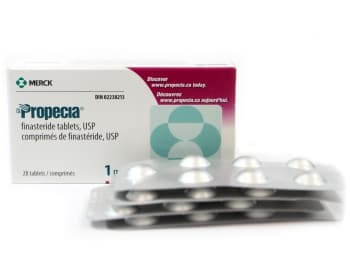 Propecia (Finasteride) is a prescription medication that is used for the treatment of male pattern baldness (androgenetic alopecia) on the crown and mid-scalp area. This medication should be used by adult men only. Finasteride works by reducing the amount of a natural body hormone (DHT). Reducing the amount of DHT leads to increased hair regrowth and slower hair loss. Propecia helps with hair lost on the head only and not on any other part of the body. This medication should be taken regularly to maintain the growth of your hair. It may take up to three months before you see the benefits of this medication. When you stop taking Finasteride, you will start losing the quantity of hair gained within twelve months. Are there any Precautions or Drug Interactions for Propecia? You should not take Propecia if you are allergic to Finasteride or if you have any other allergies. Before you start taking this medication, talk to your doctor about your medical conditions and about all the medications you are currently taking including OTC and herbal medications. Finasteride should be used in children. Finasteride is absorbed through the skin. If the film coating of the tablet is broken or the tablet is crushed, it should not be handled by a woman who is pregnant or planning to become pregnant. This medication should not be used by women, especially if she is pregnant or breast-feeding. Propecia can harm and unborn or breast-feeding baby. Propecia tablets should be stored at room temperature between 15 -30 degrees C away from light and moisture in a tightly closed container. This medication should not be stored in the bathroom.